Just how big were the dinosaurs? Just how big were the dinosaurs? This is a question that has vexed palaeontologists ever since the first fossil bones of these prehistoric animals were studied in detail. 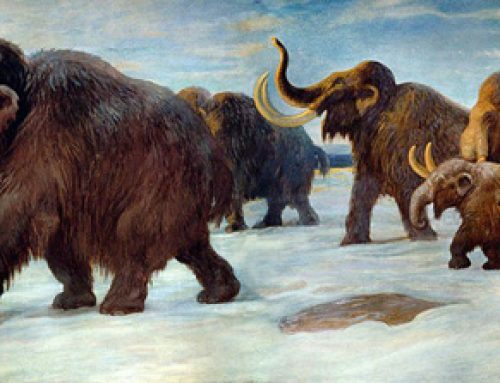 The size of extinct animals can be calculated by measuring the length of individual bones but the calculation of mass is much more difficult. Scientists at the University of Manchester have developed a new technique that “slims down” the Dinosauria. Some of the largest leviathans may not have weighed upwards of eighty metric tonnes as previously thought, around twenty-three tonnes may actually be nearer the mark. Just how big were the dinosaurs has sparked lively debate for many years, to read an article on the possible size and weight of Brachiosaurus (published in 2009): Just how big was Brachiosaurus? Palaeobiologists at the University have developed a new technique to accurately measure the weight and size of dinosaurs and discovered they are not as heavy as previously thought. University of Manchester biologists used lasers to measure the minimum amount of skin required to wrap around the skeletons of modern-day mammals, including reindeer, polar bears, giraffes and elephants. Using animals alive today, that can be weighed allows the researchers to test their calculations against the actual recorded weight of the animal. What the laser mapping technique shows, is that the dinosaurs may not have been as heavy as earlier estimates. This has implications for the study of their behaviour and locomotion, even whether some of the biggest dinosaurs of all – the long-necked Sauropods may have been capable of rearing up onto their hind legs. The Manchester based team discovered that the animals they measured had almost exactly 21% more body mass than the minimum skeletal “skin and bone” wrap volume. They then applied this to a giant Brachiosaur skeleton in Berlin’s Museum für Naturkunde, (Humboldt Museum). This skeleton stands over forty feet tall, and is made up of the fossilised bones of several individuals. It represents a Brachiosaur from Africa and it is the largest mounted dinosaur skeleton on display in Europe. Previous estimates of this Brachiosaur’s weight have varied, with estimates as high as 80 tonnes, but the Manchester team’s calculations – published in the journal Biology Letters – reduced that figure to just 23 tonnes. Still a substantial weight, but intriguing establishing the giant mammals known as the Indricotheres as potentially the heaviest land living animals known to science. The team says the new technique will apply to all dinosaur weight measurements and thus the mass of all the known dinosaurs can be calculated. “One of the most important things palaeobiologists need to know about fossilised animals is how much they weighed. This is surprisingly difficult, so we have been testing a new approach. We laser scanned various large mammal skeletons, including polar bear, giraffe and elephant, and calculated the minimum wrapping volume of the main skeletal sections”. One of the arguments put forward against depicting the dinosaurs as more agile, active creatures was their great size and weight. Despite a number of evolutionary adaptations to lighten their skeletons such as the evolution of pneumatised bones, many scientists had argued that predators such as Tyrannosaurus rex would have been just to heavy and slow to be effective hunters and therefore probably scavenged carcases. Dr. Sellers, based in Manchester’s Faculty of Life Sciences, explained that body mass was a critical parameter used to constrain biomechanical and physiological traits of organisms. 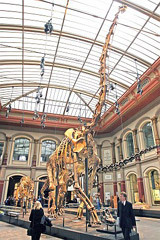 Interestingly, as scientists debate the body weights of Brachiosaurs, it is worth noting that until recently the Brachiosaur in the Berlin museum was described as belonging to the genus Brachiosaurus. However, studies of the fossil material ascribed to this genus that had been found in East Africa and the Western United States indicate that the African material is sufficient different to be put into its own, separate genus – Giraffatitan. The debate over the weight of the Dinosauria, especially the really big Sauropods is likely to rumble on. Still at twenty-three metric tonnes, this makes one particular Late Jurassic Sauropod much heavier than any land living animal alive today, many times the weight of the biggest elephants. We are grateful to the University of Manchester for supplying information in a press release for use in this article.